Keeping my maiden name after marriage was practically unheard of in my home state of Louisiana. At least it was 15 years ago when my co-worker and I had that conversation. Not one for conventional ideas, I decided long before I met my husband that I wouldn’t change my name after taking my marriage vows. When I told my husband I was writing about our different surnames, he laughed. Apparently, I informed him early in our relationship of this life choice. Good thing he knew what he was getting into. 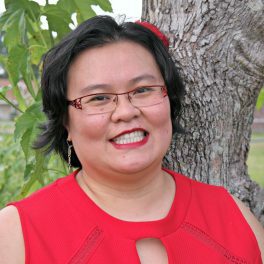 I’m Vietnamese, and in Vietnamese culture, women do not take their husband’s last name upon marriage. My aunts and cousins, however, followed western tradition. As immigrants, they didn’t want to stand out any more than they already did with their yellow skin, black hair, and small eyes. What’s in a name? Our family wouldn’t be the first to adjust their traditional names after coming to the United States. I’m not sure when I decided to keep my surname after I got married. The convention didn’t make sense to me, and I couldn’t see a good reason to take my future husband’s name. Perhaps it was because I knew deep down that I wouldn’t marry a Vietnamese man, and giving up my family’s name meant giving up part of my heritage. Whatever my reason was, I don’t regret keeping my maiden name; luckily it wasn’t a deal breaker for my husband. Keeping the name I’d owned for over 20 years didn’t mean I loved him less. We’d already decided to combine our surnames for our children. If we’d stayed in the south, I think I’d receive more resistance or questions from others. I remember how excited I was when we moved to DC soon after our wedding. My first job here was at a summer camp and I found all sorts of surname combinations. That was when I knew our kids wouldn’t stand out because of their hyphenated names. The only time I become frustrated about having a different surname than my husband’s is when the Christmas cards come rolling in. Our southern friends still address the cards as Mr. and Mrs. “Husband’s Name.” At first I was annoyed because I didn’t want my identity to be just as my husband’s wife. After 12 years of marriage and a holiday cards addressed in various ways, I’ve learn to let it go. As for my former co-worker’s comment that folks wouldn’t know that my kids were mine if we didn’t have the same last name, I couldn’t hold back my laughter. With a black husband, I knew my kids wouldn’’t look exactly like me anyway. Little did I know, 10 years later, that strangers would mistake me for my kid’s nanny. Did you keep your maiden name when you got married?